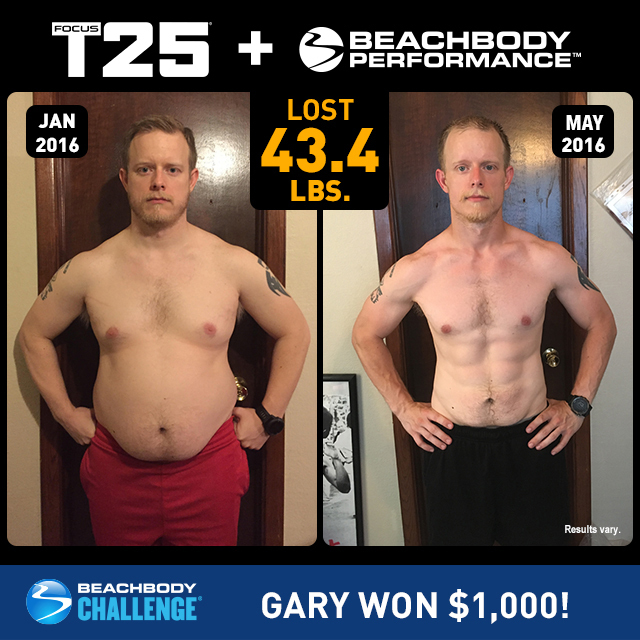 FOCUS T25 Results: Gary Lost 43.4 Pounds and Won $1,000! Gary Rhodes, age 31, lost 43.4 lbs in five months with FOCUS T25 and the Beachbody Performance supplements. He entered his results into The Beachbody Challenge and won $1,000! I have had success with Beachbody in the past. I lost over 80 lbs with two rounds of INSANITY. I then took a maintenance approach and was able to keep the weight off. Then, last year, with the economic downturn, I began to stress a lot. As others lost their jobs, my workload increased, taking up more and more of my time. Even still, the fear of losing my job lingered over my head. With all of this stress weighing on me, I pushed my fitness to the back burner. I began to eat whatever was convenient, not caring about the quality or quantity. By the end of the year I had gained nearly all of the weight back. I started dieting, and lost some weight initially, but I soon hit a plateau. I knew I needed to do more. I had gotten so ashamed of myself that I began avoiding my friends. These were good friends. We had relied on each other for motivation and accountability. Now, I would go out of my way to make sure they didn’t see me. That they didn’t see how far I had let myself go. Luckily Beachbody had thought of this. With the SuperGym and Challenge Groups on TeamBeachbody.com, I was able to find the motivation and accountability that I needed, all from home. Now, after regaining some confidence through my results with FOCUS T25, I have reconnected with some of my old friends. I now have the best of both worlds. Focus T25. 25 minutes per day. It takes away excuses. You can find/make 25 minutes in your day. The best part about it, though, is once you get started, it’s no longer a workout that you need to do. You start looking forward to it. It truly is one of the best parts of my day. I get up in the morning, push play, and I’m ready for the day. It energizes me. Not only that, but when you push play first thing in the morning, you have already accomplished a major goal for the day. You get to start off by crossing off one of the biggest items on your checklist for the day! It doesn’t get much better than that. Beachbody On Demand is great, as well. Being able to stream my workouts anywhere, helped me to stay on track and never miss a workout! It’s simple and easy to use, which is great when you are pressed on time. I have now finished the Pure Gamma Calendar, and will be doing the Pure Strength Hybrid next! I can’t wait to see what happens! I have lost 34 lbs and 10 in off my waist with Focus T25, but that’s not what I’m most proud of with this program. I have so much more energy, now, and my kids can see it. They are being inspired by my journey. They are even joining me for some workouts! They follow Tania with modified movements and take water breaks (I don’t encourage them to follow Shaun T’s craziness, lol). Being able to inspire others is amazing. I couldn’t be more proud of anything in my journey. I stand taller, now. I smile more. I move more. I can play with my children without getting winded halfway through a game. Overall, I just feel so much better. Sure, losing the weight and inches is great, but being able to look in the mirror and smile instead of just looking away in shame is incredible. T25 gave me that. T25 gave me back the life I had before the stress of work took hold of me. Accountability is sometimes the unsung hero of fitness. Many people have the perfect program, the perfect equipment, the perfect location, but they fail. Having someone to help you stay on track, can make that difference. The Challenge Group I joined solved this problem. When I have someone waiting for me to check in to let them know how my workout was that day, it gives me motivation. I won’t just be letting myself down. I’ll be letting them down. Seeing others check in helped to inspire me as well. If they can push play, so can I. Plus, it’s a lot more fun when you get to brag to others about killing a workout, that just telling yourself! Daniel gives you as much attention as you need. If I ever had a question, he was quick to answer it. No matter the question. He didn’t hover, though. He let me do my thing, but I always knew he was there if I needed him. If I decide to take the next step into coaching, I know that he will help me to succeed in that endeavor, as well.